...you are invited to participate by leading our Sunday Morning Meditation Group. Join a group of "Course in MIracles" followers to read and discuss the principles and applications for living a peaceful and joyful life every day. Love offering of $5 suggested. None are turned away for lack of funds. Living A Course in Miracles: Walking the Talk is a Unity Radio program that provides profound support for those who wish to live A Course in Miracles (resource links) day by day. 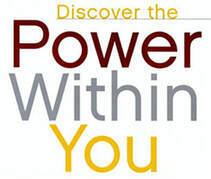 Beginning Sunday, January 27 from ​​12:00 - 2:00 P.M.
​A 7-Class Monthly Series of 2 hour classes exploring Eric Butterworth's inspiring book, "Discover the Power Within You". This author shares the greatest discovery of all time: the ability to see the divine within us. The book may be purchased at Unity of Stockton or online at SmileAmazon.com. It is not necessary to attend all 6, unless you would like S.E.E. (Spiritual Enrichment Education) credit toward prerequisites for Unity Licensed Teacher or Ministerial programs. An additional $45 to Unity Village if you wish to register for S.E.E. credit. Register for S.E.E. online at uwsi.org- or - at the end of the series in July through Unity of Stockton.